If you're looking for a great (and cheap!) hotel in South Padre Island, CheapTickets is the best place to find them. We offer deals on the best 602 hotels throughout South Padre Island. No matter what you're looking for, we have options for you. Grab great rates on the 301 affordable 3-star hotels that are easy on the wallet without sacrificing comfort. Looking for more luxury? Try one of the 11, 4-star hotel accommodations in South Padre Island. No matter your budget needs, we've pulled out all the stops to make sure you have plenty of vacation options. Maybe you prefer to search for your hotel deals based on what each hotel offers? For example, let's say you just want to find a hotel or resort that has a pool to cool off in after a long day exploring South Padre Island. Scroll down to choose from the 28 hotels in South Padre Island that has a pool for guests. Or search for deals on South Padre Island hotels offering free wifi or breakfast, non-smoking rooms, and more! CheapTickets is here to be your personal travel agent for your next trip to South Padre Island. Get booking today! What hotels in South Padre Island offer free wifi access? Are there deals on South Padre Island hotels offering free breakfast? Yes! The only thing better than finding a great deal on a cheap hotel in South Padre Island is finding one that offers free breakfast. Grab some eggs, a waffle, or some healthy oatmeal before a day full of exploring South Padre Island and all that it has to offer. Below are just some of the many hotels that offer free breakfast in South Padre Island. 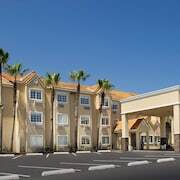 La Quinta Inn & Suites South Padre Island Beach is a 3.00 star rated hotel property in South Padre Island that offers free breakfast. 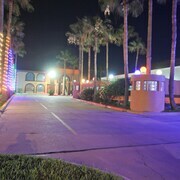 South Padre Island Inn is a 2.00 star rated hotel property in South Padre Island that offers free breakfast. Ramada by Wyndham & Suites South Padre Island is a 3.00 star rated hotel property in South Padre Island that offers free breakfast. Pearl South Padre is a 3.50 star rated hotel property in South Padre Island that offers free breakfast. What about deals on pet-friendly hotels in South Padre Island? South Padre Island is a great place to get outside and explore with your pets in tow so don't leave your furry friends behind. Below you'll find great deals on hotels in South Padre Island that allow pets. Don't forget to bring plenty of treats! The Inn at South Padre is a popular, pet-friendly, 2.00 star hotel in South Padre Island. Super 8 by Wyndham South Padre Island is a popular, pet-friendly, 2.00 star hotel in South Padre Island. South Padre Island Lodge is a popular, pet-friendly, 2.00 star hotel in South Padre Island. 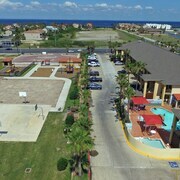 Los Cabos III Condominiums by Cheap Getaway is a popular, pet-friendly, 3.00 star hotel in South Padre Island. Any good rates on South Padre Island hotels with restaurants? Absolutely. Don't want to deal with planning our all your meals on your trip to South Padre Island? We don't blame you. Keep the hangry away by staying in one of the 8 hotels that have restaurants. With a room at one of these spots, all it takes to get a good meal is hopping in the elevator. Check out some of the most popular hotels in South Padre Island that have restaurants below. Book Peninsula Island Resort & SpaPeninsula Island Resort & Spa is a 3.50 star hotel and has one or more restaurant options. 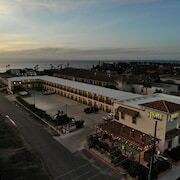 Book La Copa Inn Beach HotelLa Copa Inn Beach Hotel is a 3.00 star hotel and has one or more restaurant options. Book Pearl South PadrePearl South Padre is a 3.50 star hotel and has one or more restaurant options. Book Hilton Garden Inn South Padre Island BeachfrontHilton Garden Inn South Padre Island Beachfront is a 3.50 star hotel and has one or more restaurant options. What are the cheapest hotels in South Padre Island with pools? What's better after a long day exploring South Padre Island then a relaxing dip in a pool? Finding the South Padre Island hotel you need for a bargain! Cool off and unwind at one of our 28 South Padre Island hotels with a pool. Browse some of the top deals on these hotels and resorts with pools in South Padre Island below, but be warned: You may not want to check out! Hilton Garden Inn South Padre Island Beachfront has a pool and a 3.50 star rating. Motel 6 South Padre Island has a pool and a 2.00 star rating. Schlitterbahn Beach Resort and Waterpark has a pool and a 3.50 star rating. Best Western Beachside Inn has a pool and a 2.50 star rating. What hotels in South Padre Island offer parking for guests? Once you've made your way to South Padre Island, the last thing you want to deal with is finding parking close to your hotel. Avoid the hassle of parking around the block and carrying your luggage all the way to the lobby by booking one of our hotels with parking. Check out deals on some of the 35 hotels in South Padre Island that offer parking for guests. Port Isla Inn This hotel has a 2.00-star rating. Casa Rosa Motel This hotel has a 2.00-star rating. Saida III Condominium This hotel has a 3.00-star rating. Suites At Sunchase This hotel has a 3.00-star rating. Do South Padre Island hotels offer 24-hour concierge services? When you're on vacation, things don't always go according to plan. Travel with peace of mind when you book one of our 5 hotels in South Padre Island with 24-hour concierge service. That way you know help is always phone call or elevator ride away. Try Pearl South Padre. It's a 3.50 star rated hotel in South Padre Island that offers concierge services 24 hours a day. Try Peninsula Island Resort & Spa. It's a 3.50 star rated hotel in South Padre Island that offers concierge services 24 hours a day. Try Holiday Inn Express Hotel & Suites South Padre Island. 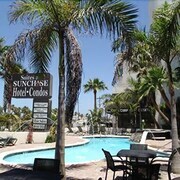 It's a 2.50 star rated hotel in South Padre Island that offers concierge services 24 hours a day. What about low rates on non-smoking hotels in South Padre Island? Pearl South Padre This hotel has a 3.50-star rating. La Copa Inn Beach Hotel This hotel has a 3.00-star rating. What are the cheapest South Padre Island 3-star hotel deals? Our 3-star hotels bring you quality accommodations at a lower price point for the perfect, budget-friendly vacation in South Padre Island. With 301 3-star hotels throughout South Padre Island to choose from, you still have options. Browse our selection below. La Copa Inn Beach Hotel. Located across from the Queen Isabella Causeway, this oceanfront resort on South Padre Island is 1 mile from Schlitterbahn Water Park, Osprey Deep Sea Fishing Trips, and Breakaway Cruises dolphin-watching excursions. Ramada by Wyndham & Suites South Padre Island. Located on the gulf side of South Padre Island with private beach access, this hotel is on South Padre Island’s main strip and within a mile of the entertainment district. A golf course is nearby. Pearl South Padre. 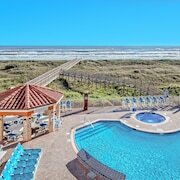 This oceanfront resort is located on South Padre Island, along the coast of south Texas. The island is a sand barrier lying in the Gulf of Mexico; egrets and ibis flourish in the semitropical climate. The resort includes a full-service spa. La Quinta Inn & Suites South Padre Island Beach. This beachfront hotel is on South Padre Island Beach. Horseback riding and deep sea fishing are available within a mile. What are the best deals on 4-Star Hotels in South Padre Island? South Padre Island is full of hotels and it can be hard to narrow down where you really want to stay. Luckily, we've done that hard work for you be narrowing you from 602 hotels throughout South Padre Island, to the 11 4-star hotels in South Padre Island. Our 4-star hotels in South Padre Island are exactly what you need for your next family trip, romantic weekend, or solo getaway. Check out our most popular deals below. Sea Vista by South Padre Condo Rentals: Situated in South Padre Island, this condo is within 1 mi (2 km) of Queen Isabella State Fishing Pier and Schlitterbahn Beach Waterpark. Isla Blanca Park and University of Texas Pan American Coastal Studies Laboratory are also within 1 mi (2 km). Mesquite House: Located across from the Queen Isabella Causeway, this oceanfront resort on South Padre Island is 1 mile from Schlitterbahn Water Park, Osprey Deep Sea Fishing Trips, and Breakaway Cruises dolphin-watching excursions. Accommodations and considerations for a pet friendly stay. Wear and tear along with some weathering has the room I was assigned in need of updating and remodeling. Place was cleanliness and perfect location on the island, not a fan of the small pool area Overall great stay! Although an older facility- it had more charm and character than the cookie cutter condos/hotels. There was someone always cleaning and taking care of peoples' needs. The staff were more than helpful and friendly. The location is convenient, and as far as the negative reviews I had read prior to booking- those people must actively look for problems. The only area I had concern for was the condition of the hot tub- I chose not to use it-so it is others problems! I will definitely go back there and recommend to anyone if you want character and service-this is the place! Amazing experience really enjoyable! will do it again in a couple of months.